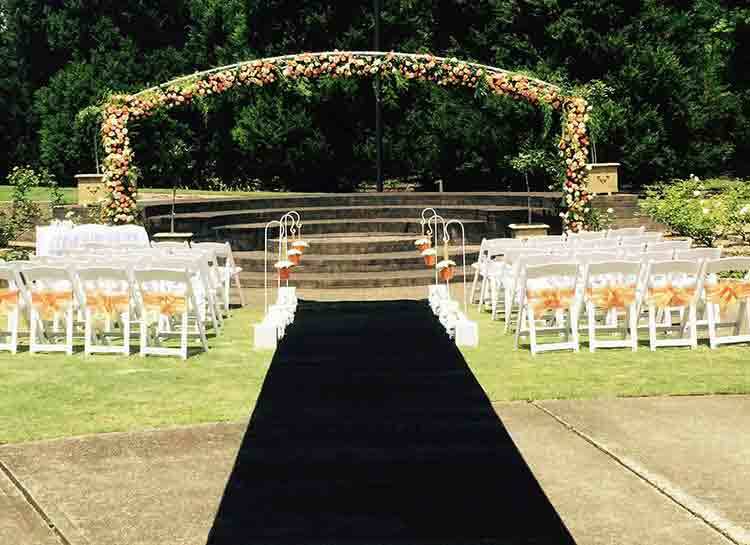 Adorable Wedding Concepts recommended ceremony setup is the Eternity Wedding Ceremony Package is $980 inc. gst and comes with the following wedding ceremony decorations. The Sunken Rose Garden is at the center of the Auburn Botanic Gardens adjacent to the Scented Garden and one 3 venues available in the grounds along with the Japanese Gardens. We love styling a wedding ceremony at this venue as it has a fantastic arch that can be used as a decorative backdrop for a wedding ceremony. The garden location is alive with colour and scent in the early part of the wedding season (October and January) but is still a great venue outside of these months. The area has a great space that is suitable for wedding ceremonies of up to 200 people. Visitors must ensure that children and young people under the age of 18 years are supervised at all times. You’ll need to book ahead at this venue and taking food into the Gardens or feeding the native animals, birds and fish is not permitted.